1975-04-02. New. Ships with Tracking Number! INTERNATIONAL WORLDWIDE Shipping available. Buy with confidence, excellent customer service! 1970-05-01. Good. Ships with Tracking Number! INTERNATIONAL WORLDWIDE Shipping available. May not contain Access Codes or Supplements. May be ex-library. Shipping & Handling by region. Buy with confidence, excellent customer service! Princeton University Press. Hardcover. 0691097720 New Condition. . New. Princeton University Press. Hardcover. 0691097720 Like New Condition. . Fine. Routledge and Kegan Paul, 1969. First printing of the second edition. Hardcover. Very good/No Dj cover. VGC.Routledge and Kegan Paul,1969.Second edition.First printing of the second edition.Translated by R.F.C. Hull.Green hardback(gilt lettering on the front cover and spine,crease on the edges of the spine,two small dents and nicks on the edges of the cover and spine) in VGC, no Dj cover.Illustrated with a b/w plate.Nice and clean pages with two small ink marks on the outer edges,previous owner's own sticker inside the front cover, previous owner's name and date written on the edges of the front endpaper.The book is in VGC for its age with light shelf wear.No Dj cover.708pp including Foreword to the I Ching,bibliography,index.Heavy book (approx 1.2 Kg). Routledge & Kegan Paul, 1958. The Collected Works of C.G. Jung; Volume 11, Translated by R.F.C. Hull. 698 pages in very good condition. Previous owner's name on the ffep. Green hardcovers with gilt titles. Very light wear on corners and edges. No dust jacket. VG. Hard Cover. Very Good. London: Routledge & Kegan Paul, 1969. Jacket rubbed, chipped and tanned with some foxing, small price sticker to front flap. Slightly damp affected, boards spotted, closed edges foxed and tanned, pages a little rippled, else textblock clean and tight.. Second Edition. Cloth. Fair/Fair. 8vo. Princeton University Press, 1977. Book. Very Good. Hardcover. 2nd Edition. Volume 11 only, dust jacket slightly worn, exterior page edges slightly smudged, unmarked. 2nd edition, 4th printing 1977. Black dust jacket..
New Haven, CT: Yale University Press, 1966. PB. 5 1/4 x 8 1/4. Based on the Terry Lectures delivered at Yale University. Softcover, as new. 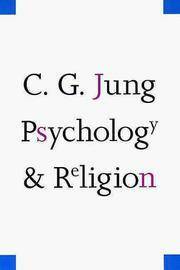 "These compact vigorus essays constitute Dr. Jung's most sustained interpretation of the religious function in individual experience. Yale University Press, 1968. This is an ex-library book and may have the usual library/used-book markings inside.This book has soft covers. In good all round condition. Yale University Press. B0008AM41U The book has a dust jacket. The dust jacket is discoloured down the spine. There is a small hole to the front of the dust jacket. Pages are tanned. Pages are intact and not marred by notes or highlighting. The cover and spine have some wear but remain intact. Embossed font to the spine is bright and intact. -- Re-Read is a social enterprise that trades in and recycles books to reduce waste, save them from landfill and provide services and activities that promote literacy, education attainment and quality of life in South Yorkshire and supports Askern Community Library. All overseas shipping is via Airmail. . Fair. 1974. New Haven, CT: Yale University Press, 1966. good trade paperback with some wear and batter. Trade Paperback. Good. Yale University Press, 1960. Trade paperback, photo of Jung thinking on front wrapper, white spine and back wrapper very slightly browned, name and address label at top of first front end paper, 131 pages. Ink underlining in early pages, creases near top front tip, very slight wear to front edges, tiny tear at spine bottom edge, lightly browned back wrapper. Fair.. First Thus. Trade Paperback. Fair. Yale University Press. Good. 1938. Paperback. 7.90 X 5 X 0.40 inches; 181 pages . Yale University Press. PAPERBACK. B0026YNBAY We ship daily + good service buy with confidence . Fair. Yale University Press. PAPERBACK. B0026YNBAY Very Good Condition. Has some wear. Five star seller - Buy with confidence! . Very Good.